The U.S. Department of Agriculture (USDA) has designated 204 counties across 10 states—Georgia, Alabama, Florida, The Carolinas, Missouri, Arkansas, Kansas, Kentucky and Tennessee—as agricultural disaster areas due to damages and losses caused by excessive rain and flooding in two separate declarations. USDA has designated 148 counties across six states—Georgia, Alabama, Florida, The Carolinas and Tennessee—as agricultural disaster areas due to damages and losses caused by excessive rain that began April 1, 2013, and continuing. Georgia: Appling, Clinch, Grady, Macon, Treutlen, Turner, Twiggs, Union, Atkinson, Coffee, Greene, Madison, Walton, Ware, Washington, Wayne, Bacon, Colquitt, Gwinnett, Miller, Wheeler, Wilcox, Wilkinson, Baker, Cook, Hancock, Mitchell, Bibb, Dooly, Henry, Monroe, Baldwin, Crawford, Hart, Montgomery, Bulloch, Dougherty, Houston, Murray, Banks, Crisp, Irwin, Morgan, Butts, Early, Lee, Pickens, Barrow, Decatur, Jackson, Newton, Calhoun, Evans, Liberty, Pulaski, Ben Hill, De Kalb, Jasper, Oconee, Camden, Forsyth, Lincoln, Rabun, Berrien, Echols, Jeff Davis, Oglethorpe, Candler, Fulton, Long, Richmond, Bleckley, Effingham, Jefferson, Peach, Charlton, Glynn, Lumpkin, Schley, Brantley, Elbert, Jenkins, Pierce, Clayton, Gordon, McDuffie, Stephens, Brooks, Emanuel, Johnson, Putnam, Dawson, Habersham, McIntosh, Sumter, Bryan, Fannin, Jones, Rockdale, Dodge, Hall, Marion, Burke, Franklin, Lanier, Screven, Talbot, Taliaferro, Tattnall, Toombs, Chatham, Gilmer, Laurens, Seminole, Upson, Warren, White, Wilkes, Clarke, Glascock, Lowndes, Taylor, Worth, Telfair, Thomas, Tift and Towns counties. Florida: Baker, Gadsden, Jackson, Leon, Columbia, Hamilton, Jefferson and Madison counties. North Carolina: Cherokee and Clay counties. South Carolina: Abbeville, Anderson, Jasper, Aiken, Barnwell, McCormick, Allendale, Hampton and Oconee counties. USDA has designated 56 counties across five states—Missouri, Arkansas, Kansas, Kentucky and Tennessee—as agricultural disaster areas due to damages and losses caused by excessive rainfall and flooding that occurred July 15 – August 19, 2013. Missouri: Butler, Gasconade, New Madrid, Stoddard, Camden, Laclede, Osage, Texas, Cole, Maries, Pemiscot, Vernon, Dunklin, Miller, Pulaski, Webster, Barton, Cape Girardeau, Dent, Mississippi, St. Clair, Bates, Carter, Douglas, Moniteau, Scott, Benton, Cedar, Franklin, Montgomery, Shannon, Bollinger, Christian, Greene, Morgan, Warren, Boone, Crawford, Hickory, Phelps Callaway, Dallas, Howell, Ripley, Wright and Wayne counties. Arkansas: Clay, Craighead, Greene and Mississippi counties. Kansas: Bourbon, Crawford and Linn counties. Tennessee: Dyer and Lake counties. All counties listed above were designated as agricultural disaster areas on September 25, 2013. “Secretary Vilsack also reminds producers that Congress has not funded the five disaster assistance programs authorized by the 2008 Farm Bill. These are SURE; the Livestock Indemnity Program (LIP); the Emergency Assistance for Livestock, Honey Bees, and Farm-Raised Fish (ELAP); the Livestock Forage Disaster Program (LFP); and the Tree Assistance Program (TAP). Production losses due to disasters occurring after Sept. 30, 2011, are not eligible for disaster program coverage,” said USDA. 1. The total number of counties designated as agricultural disaster areas includes both primary and contiguous disaster areas. 2. USDA trigger point for a countywide disaster declaration is 30 percent crop loss on at least one crop. 3. The U.S. has a total of 3,143 counties and county-equivalents. About 64.09 percent of the land in the contiguous Unites States were covered by drought conditions D0 (Abnormally Dry) to D4 (Exceptional Drought) week ending September 17, 2013, up from 63.75 percent the previous week, according to the U.S. Drought Monitor. Drought conditions D1 – D4 improved marginally to 48.19 percent, down from 50.69 percent earlier. The combination of ample Gulf and Pacific tropical moisture (in part from Tropical Storms Manuel (Pacific) and Ingrid (Gulf) which inundated Mexico), stalled frontal systems, and upsloping conditions produced widespread heavy to copious rainfall (widespread 2 to 6 inches, locally 12 to 18 inches especially near Boulder, CO) and severe flash flooding in parts of New Mexico and Colorado. Moderate to heavy rains (1.5 to 4 inches) also drenched portions of Arizona, eastern Nevada, Utah, Wyoming, south-central Montana, western sections of Nebraska, Kansas, Oklahoma, and northern and southern Texas. September monsoonal rains have generated welcome relief from the drought in the Southwest, central Rockies, and High Plains, but unfortunately have been accompanied by flash flooding. As of September 18, 2013, at least 1,345 counties and parishes, or 42.8% of all the U.S. counties and county equivalents, across 29 states have been designated as agricultural disaster areas due to the ongoing drought. Drought and Deluge Prompt Disaster Declarations in Multiple Regions across U.S. The U.S. Department of Agriculture (USDA) has designated 194 counties in 13 states across 5 regions as agricultural disaster areas due to damages and losses caused either by drought, or by one or more of hail, severe freezing, excessive snow, excessive rain and flooding. As of September 18, 2013, at least 1,345 counties and parishes, or 42.8% of all U.S. counties and county equivalents, were designated as agricultural disaster areas due to the ongoing drought. 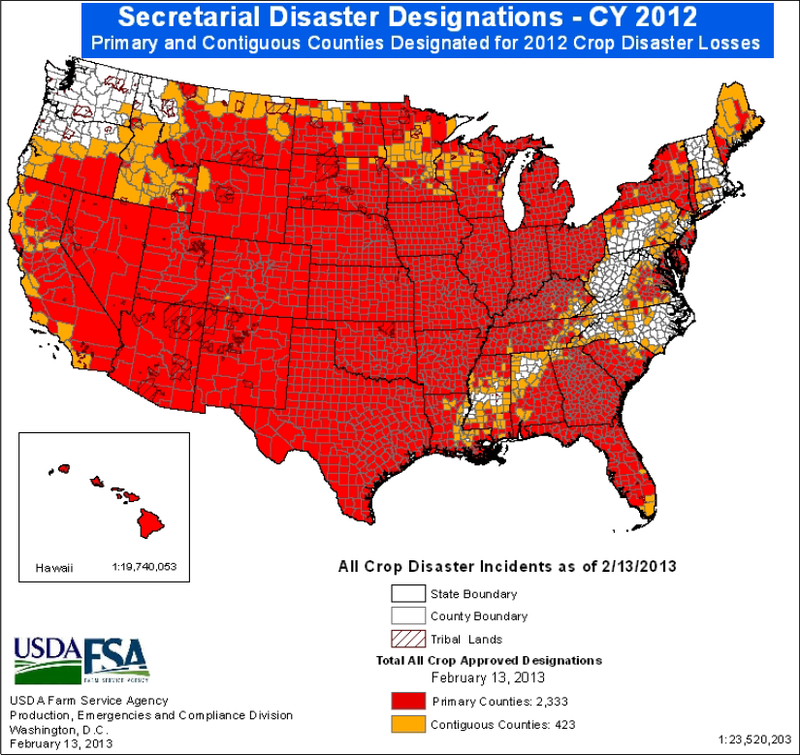 Since September 11, 2013 a total of 332 counties have been designated as Agricultural Disaster Areas. USDA has designated a total of eight counties in Idaho and Montana as Agricultural Disaster Areas. Idaho: Clearwater, Lewis, Idaho, Latah, Nez Perce and Shoshone counties. Montana: Mineral and Missoula counties. USDA has designated 102 counties in five states—Alabama, Florida, Georgia, Mississippi and Tennessee—as Agricultural Disaster Areas due to damages and losses caused by excessive rain and flooding that began January 1, 2013, and continues. Alabama (64 Counties): Autauga, Cleburne, Geneva, Macon, Baldwin, Coosa, Greene, Madison, Barbour, Covington, Hale, Marengo, Blount, Crenshaw, Henry, Mobile, Bullock, Cullman, Houston, Monroe, Calhoun, Dale, Jackson, Montgomery, Cherokee, Dallas, Jefferson, Morgan, Chilton, Elmore, Lamar, Perry, Choctaw, Etowah, Lauderdale, Pickens, Clarke, Fayette, Lowndes, Pike, Russell, St. Clair, Shelby, Sumter, Talladega, Tallapoosa, Tuscaloosa, Walker, Washington, Wilcox, Bibb, Coffee, Escambia, Marion, Butler, Colbert, Lawrence, Marshall, Chambers, Conecuh, Lee, Randolph, Clay, De Kalb, Limestone and Winston counties. Florida (5 Counties): Escambia, Holmes, Jackson, Okaloosa and Walton. Georgia (13 Counties): Carroll, Clay, Floyd, Polk, Chattahoochee, Dade, Haralson, Quitman, Chattooga, Early , Muscogee, Seminole and Stewart. Mississippi (11 Counties): Clarke, Jackson, Lowndes, Tishomingo, George, Kemper, Monroe, Wayne, Greene, Lauderdale and Noxubee. Tennessee (7 Counties): Franklin, Hardin, Lincoln, Wayne, Giles, Lawrence and Marion counties. USDA has designated 54 counties in three states—The Carolinas and Tennessee—as Agricultural Disaster Areas due to damages and losses caused by excessive rain and flooding that began May 1, 2013, and continues. North Carolina (41 Counties): Avery, Cleveland, Henderson, Rutherford, Brunswick, Columbus, Madison, Transylvania, Buncombe, Durham, Orange, Watauga, Wilson, Alamance, Chatham, Jackson, New Hanover, Ashe, Edgecombe, Johnston, Pender, Bladen, Gaston, Lincoln, Burke, Granville, McDowell, Pitt, Caldwell, Greene, Mitchell, Polk, Caswell, Haywood, Nash, Person, Robeson, Wake, Wayne, Wilkes and Yancey counties. South Carolina (8 Counties): Cherokee, Greenville, Oconee, Spartanburg, Dillon, Horry, Pickens and York counties. Tennessee (5 Counties): Carter, Cocke, Greene, Johnson and Unicoi. USDA has designated 22 counties in Minnesota and Iowa as Agricultural Disaster Areas due to the combined effects of severe freezing and excessive snow followed by excessive rainfall and flooding that occurred January 1 – August 2, 2013. Minnesota (18 Counties): Dodge, Koochiching, Mower, Steele, Freeborn, Lake of the Woods, Olmsted, Beltrami, Goodhue, Roseau, Waseca, Faribault, Itasca, St. Louis, Winona, Fillmore, Rice and Wabasha counties. Iowa (4 Counties): Howard, Mitchell, Winnebago and Worth. USDA has designated 8 counties in Minnesota and Wisconsin as Agricultural Disaster Areas due to damages and losses caused by hail that occurred August 6, 2013. Minnesota: Dakota, Goodhue, Ramsey, Scott, Hennepi, Rice and Washington counties. October. To date, rainfall across the region has varied both across countries and as compared to normal rainfall patterns in previous years. Delays to the rainy season occurred in the Gulf of Guinea countries, particularly in western Nigeria, Ghana, Liberia, Togo and Benin with recently recorded rains occurring at below-average levels. Insufficient and poorly-distributed rainfall has occurred since June, leading to increasing rainfall deficits across the Gulf of Guinea countries with these countries currently experiencing a 30-day rain deficit. 323,396 people have been affected by floods this rainy season so far. More than 40,000 people been displaced by floods, including 20,000 in Mali and at least 10,000 in Benin. Floods have destroyed or damaged more than 22,600 homes. At least 34,000 Hectares of agricultural land have been destroyed by floods. In Nigeria over 80,000 people have been affected by floods in the past two months, with the states of Abia, Zamfara, Bauchi and Kogi being the most affected out of 21 states impacted. Delays in onset of the rainy season likely to have impact on agricultural yields. 30-day rain deficits recorded in Nigeria, Ghana, Liberia, Togo, and Benin. Damaging floods have occurred in nine countries in the region, most recently in Benin, Mali, Niger, Nigeria and Senegal. Other affected countries include Burkina Faso, Mauritania, Guinea and Gambia. Flooding in the northeast, drought and extreme heat in the south, central and the southwest affecting about 20 percent of China’s population, FIRE-EARTH models show. Flooding in northeast China’s Jilin, Heilongjiang and Liaoning provinces has left dozens of people dead, millions affected and at least a million others relocated. The deluge has destroyed or damaged at least 55,000 houses in Jilin and Heilongjiang provinces, with the direct economic losses direct economic losses estimated at 10 billion yuan (1.6 billion U.S. dollars), said a report. Torrential rains and floods triggered by Typhoon Utor have affected 680,000 people in eight cities in Guangxi. Some 16,660 hectares of crops have been damaged and 1,080 houses have been destroyed. In Guangdong Province, TY UTOR has affected more than 2.5 million people destroying about 4,000 houses and forcing 321,500 people to relocate. The extreme rain has also ruined 173,333 hectares of farmland, according to local authorities. “In central China’s Hunan Province, landslides triggered by continuous rainfalls over the past two days have left one dead and 14 others buried or missing,” said a report. The heat wave has spread across the province since July, causing rivers and reservoirs to dry up and affecting 16.67 million people, or about 48 percent of Guizhou’s total population, according to the headquarters. “Half of the 88 counties in our province are on the ‘worst-hit’ list, with more than 2.98 million people facing drinking water shortages,” said an official with the headquarters. In Wumian, a village some 240 kilometers southeast of Guiyang, the provincial capital, villagers have had to queue up at the only well in the village to get water. Villager Yang Aduo told Xinhua that he waited two hours before getting a bucket of water, and he had to wait several hours for the sediment to settle before drinking. A heatwave that has been hovering over a large region encompassing eight provinces and municipalities in central, eastern and southern China has already been the longest lasting since 1961 (presumably when record-keeping began), with the temperatures reaching or exceeding 35ºC for an average of 25.3 day since July 1, said the National Meteorological Center (NMC). Worsening drought an the long-lasting heatwave have “taken a heavy toll on agriculture and made drinking water increasingly difficult to obtain,” said the report. At least 130 million people in China have been affected by the drought and extreme heat. More than 10 million people, and as many livestock, are short of drinking water, FIRE-EARTH estimates. See earlier posts on China drought. Since August 1, at least 400 people have been killed and more than 2,500 others wounded amid growing violence in Iraq. In July, at least 1,057 people were killed and thousands more injured. Since the beginning of this year, at least 4,500 people have lost their lives to the violence. Vietnam’s coffee production for 2013-2014 is estimated at about 1.2 million tons, a decrease of 15 percent compared to the previous year, said the Vietnam Coffee and Cocoa Association (Vicofa). The decrease is due to the drought and hail in June, which damaged about 5,000 hectares of coffee plantation and affected other 27,000 hectares, said a report. U.S. Secretary of Commerce Pritzker has declared a commercial fishery failure for the oyster fishery in Apalachicola Bay, said a report. A cholera outbreak in northeast Afghanistan has infected 1,492 people, killing at least one person and leaving more than 100 in critical condition, local officials told reporters. Russian authorities have declared states of emergency for five populated regions in Russia’s far east following severe flooding. “An emergency situation has been declared in the Republic of Sakha (Yakutia), the Khabarovsk and Primorye territories, the Amur region and the Jewish autonomous region, and a federal level of response has been introduced there,” according to a statement posted on the Emergency Situations Ministry website. The decision was made “in view of the current hydrological situation in the Far Eastern Federal District and an adverse weather forecast,” it said. “According to earlier reports, the flood situation aggravated in the Amur region due to lengthy rains and the dumping of water from the Zeisk Hydroelectric Power Plant, which have affected dozens of populated areas. A state of emergency has been put in place in the region,” said a report. Torrential rains and flooding in Raton have caused substantial damage to the infrastructure, prompting the authorities to declare the city a disaster area, said a report. In July, Governor Martinez declared a statewide emergency following the damage caused by severe storms and flooding. Officials have declared a State of Emergency in Miller county due to serious flooding concerns, said a report. Outagamie County has declared an emergency, after severe damage caused by two tornadoes, an F1 and F2, and a line of powerful storms in which they were hidden, said a report. The storms left at least 1 dead and 3 others injured, said a report. “The storm caused damaged in Fremont, New London, Waupaca and Weyauwega, knocking down numerous trees and power lines. In New London, Trinity Lutheran Church on Beckert Road was severely damaged. Power is out near the Waupaca airport and areas to the east,” according to the Waupaca County Sheriff’s Department. The Village of Hortonville in Outagamie County, Wis., has declared a State of Emergency following significant damage to property and infrastructure and a blanket power outage caused by storms that hit Wisconsin early Wednesday morning. The storms knocked out power to tens of thousands of homes in the region. The authorities have also issued a curfew, effective Wednesday 10:00 p.m.
A severe heat alert was issued for 38 of Japan’s 47 prefectures, as temperatures climbed over 35ºC (95ºF), said Japan Meteorological Agency. Shimanto town in southwestern Kochi prefecture recorded a high of 37.7ºC (100F), the agency said. Persistent drought since June has affected 27.11 million people in “11 provincial-level areas across China,” said the Ministry of Civil Affairs (MCA). The drought has left 5.1 million people and 1.56 million livestock short of drinking water, with the direct economic losses put at 12.21 billion yuan (1.99 billion U.S dollars), MCA reported. The drought has also damaged or destroyed 2.6 million hectares of crops nationwide, according to the report. See FIRE-EARTH post Major Catastrophe Unfolding in China, and the related links. Livestock are dying in large numbers on farms due to the shortage of grass and fodder, and imported hay “is leaving animals more vulnerable to disease and infection,” said a report. The number of mortalities of cattle in the first four months of this year has risen by a staggering 31 percent to 152,000, up 36,000 compared with the same period in 2012, according to the official figures released by the Department of Agriculture. As winter continues to persist over large tracts of the Irish countryside the lack of fodder has left tens of thousands of farmers despondent, despite large imports of French hay and British silage, said the report. The cost to the Irish economy is put at €1bn [$1.3bn,] for the disastrous summer of 2012 and the “everlasting” winter this year. While religious vigils are being held in Counties Cork and Kerry and special Masses in Mayo, with the farmers praying for better weather, a scientist has suggested that the problem is due to the persistent anti-cyclones that have become “locked” over Ireland bringing cold, dry polar air, instead of the warm moist air from the south which is the norm for this time of year. “Whether it is due to something that is ‘gone’ in our climate as a result of climate change or not is open to speculation. There is some research linking the location and weakness of the jet stream to the south with the removal of the summer sea ice in the Arctic Ocean,” said Prof. John Sweeney of National University of Ireland, Maynooth. The U.S. Department of Agriculture (USDA) has designated 37 counties in five states—Texas, California, Utah, Nevada and Arizona—as primary or contiguous agricultural disaster areas, due to damages and losses caused by the ongoing drought. Texas: Atascosa, Bandera, Bexar, Coleman, Comal, Concho, Crane, Crockett, Ector, Glasscock, Guadalupe, Kendall, McCulloch, Medina, Menard, Midland, Reagan, Runnels, Schleicher, Tom Green, Upton and Wilson counties. California: Fresno, Madera, Mariposa, Merced, Mono and Tuolumne counties. Utah: Beaver, Iron, Millard and Washington counties. Nevada: Clark, Lincoln, Nye and White Pine counties. US Drought Map as of April 23, 2013, released by US Drought Monitor on April 25, 2013. The U.S. Department of Agriculture (USDA) has designated 202 additional counties in 13 states as primary and contiguous disaster areas due to damages and losses caused by the recent drought. Those states are California, Colorado, Idaho, Iowa, Kansas, Missouri, Montana, Nebraska, Nevada, South Dakota, Texas, Utah, and Wyoming. The worst hit state this week was Nebraska with 89 counties designated as primary disaster areas and 3 others as contiguous disaster areas. Texas was second with 25 counties, followed by Wyoming where 23 counties were designated as drought disaster areas. 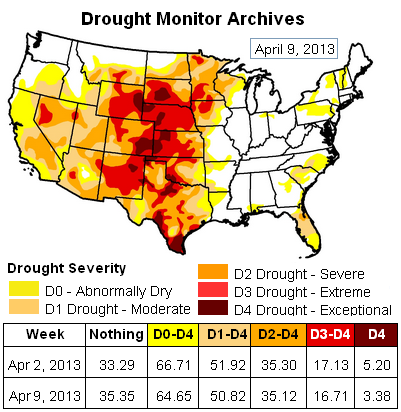 US Drought Map as of April 9, 2013, released by US Drought Monitor on April 11, 2013. The U.S. Department of Agriculture (USDA) has designated 10 counties in Iowa and Minnesota as [primary and contiguous] agricultural disaster areas due to damages and losses caused by the recent drought. Emmet, Humboldt, Pocahontas, Wright, Hancock, Palo Alto and Winnebago counties. U.S. Drought Map for March 19, 2013; released by the U.S. Drought Monitor on March 21, 2013. As of about 65.24 percent of Contiguous U.S. remains abnormally dry or worse. 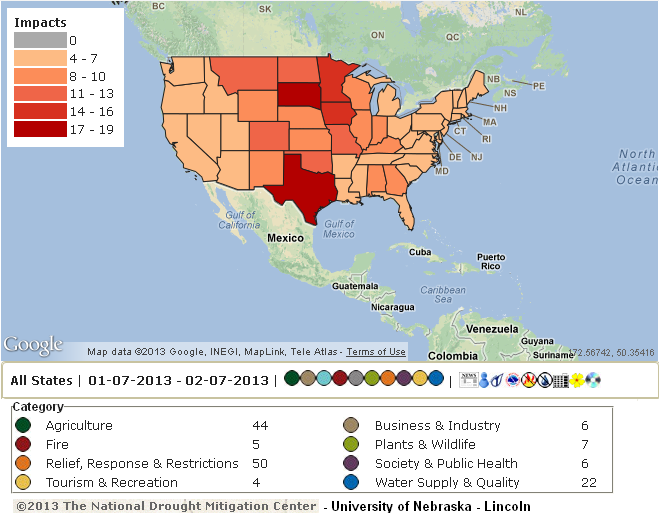 ‘Moderate’ to ‘Exceptional’ drought conditions (D1 – D4 on the chart) cover nearly 52 percent of the country. D1 – D4 drought conditions prevail in 91.29 percent of High Plains, more than 63 pct of the West, 58.96 pct of the South, 33.30 pct of Midwest and 23.24pct of Southeast. As of March 12, 2013, about 63.67 percent of Contiguous U.S. was ‘abnormally dry’ or worse (D0 – D4 drought conditions on the U.S. Drought Monitor scale). 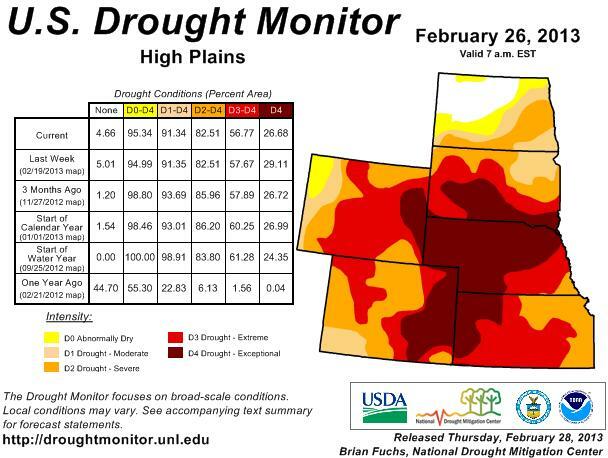 More than 95 percent of High Plains was ‘abnormally dry’ or worse last week . About 76 percent of the West, 64 percent of South, 51 percent of Midwest, and 45 percent of Southeast were also in D0 – D4 drought conditions last week. U.S. Drought Map for March 12, 2013; released by the U.S. Drought Monitor on March 14, 2013. As of March 5, 2013, about 65.67 percent of Contiguous U.S. was “abnormally dry” or worse, D0 – D4 drought conditions on the U.S. Drought Monitor scale. U.S. Drought Map for March 5, 2013; released by the U.S. Drought Monitor on March 7, 2013. 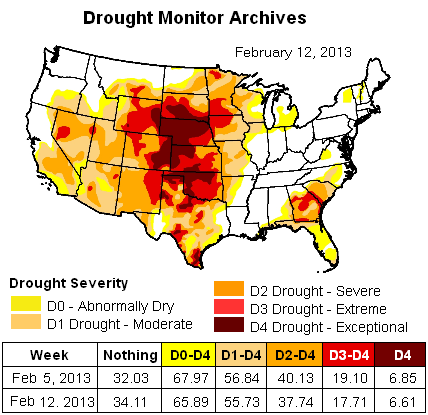 As of February 26, 2013, about 66.38 percent of Contiguous U.S. was abnormally dry or experiencing drought conditions, U.S. Drought Monitor reported. U.S. Drought Map for February 26, 2013; released by the U.S. Drought Monitor on February 28, 2013. Drought Map for the U.S. High Plains. The U.S. Department of Agriculture (USDA) has designated 135 counties across 10 states and an independent city in Nevada as agricultural disaster areas due to damages and losses caused by the recent drought. The states are Arizona, California, Florida, Georgia, Nevada, New Mexico, Oregon, Texas and Utah. The designations include both primary and contiguous disaster areas. US Drought Map for February 19, 2013, Released by the U.S. Drought Monitor on February 21, 2013. The map was prepared before the current winter storm. Weather Hazards forecast for Friday across the U.S.
‘Snow, heavy at times, will impact the Upper Great Lakes, Washington and Oregon Cascades, and northern Rockies on Friday. Meanwhile, significant ice accumulations are possible for the central Appalachians. Further south, severe thunderstorms may develop along the central Gulf Coast, with heavy rainfall capable of river and/or flash flooding from southern Mississippi to the eastern Carolinas.’ NOAA forecasters reported. The storm brought snow, sleet and freezing rain to the U.S. Midwest on Thursday, forcing hundreds of flight cancellations. The system is forecast to hit the East Coast, dumping heavy snow on parts of New England for a third consecutive weekend. Earlier, NWS issued a Winter Storm Warning for all of Kansas, nearly all of Missouri, as well as most of Nebraska and Iowa. Advisories were also issued for parts of South Dakota, Minnesota, Illinois, Indiana, Ohio, Kentucky, West Virginia and Virginia, Colorado, New Mexico, Oklahoma, northern Texas and Arkansas. Kansas Governor has already signed an emergency declaration for all 105 Kansans counties yesterday, shutting down all state offices in the Executive Branch. A state of emergency has been declared in Missouri in response to the severe winter storm. SPC received 18 storm reports including 3 tornadoes in Mississippi and Louisiana on Thursday. Moderate to heavy damage reported in counties Jefferson Davis (MS), as well as Concordia and Vernon (LA). 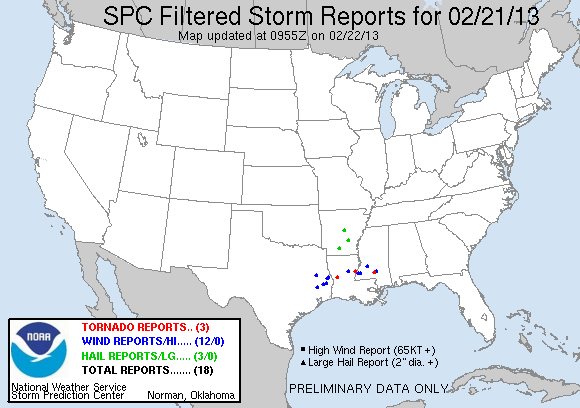 SPC filtered storm reports- 21 Feb 2013. 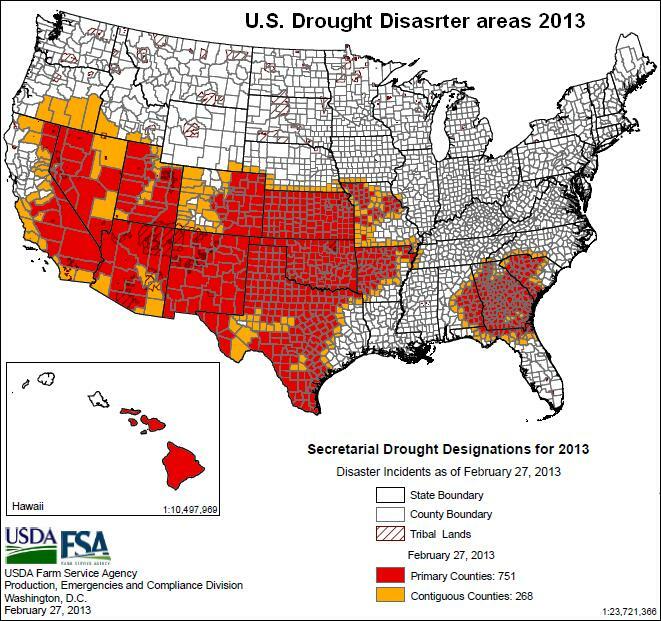 As of February 19, 2013 more than two-thirds of Continental U.S. was experiencing drought or was abnormally dry. The U.S. Drought Monitor reported. The report was prepared before the current winter storm, which may have alleviated the drought conditions in parts of the High Plains. The U.S. Department of Agriculture (USDA) has designated 21 counties in 4 states—New Jersey, Delaware, New York, and Pennsylvania—as natural disaster areas, both primary and contiguous, due to damages and losses caused by the combined effects of drought, high winds (derecho), hail, excessive heat, excessive rain, flash flooding, Hurricane Sandy, a snowstorm and a nor’easter that occurred during the period of June 28 – November 8, 2012. As of February 13, prior to the latest designations, about 980 counties, nearly a third of all U.S. counties, had been designated for 2013 crop disaster losses, USDA reported. The White House has declared a major disaster exists in the State of Mississippi in the areas affected by severe storms, tornadoes, and flooding beginning on February 10, 2013, and continuing. The worst affected areas are Forrest and Lamar Counties. The U.S. Department of Agriculture (USDA) has designated 51 counties in Georgia and 5 counties in Florida as drought disaster areas due to damages and losses caused by the recent drought. The designations include both primary and contiguous disaster areas. 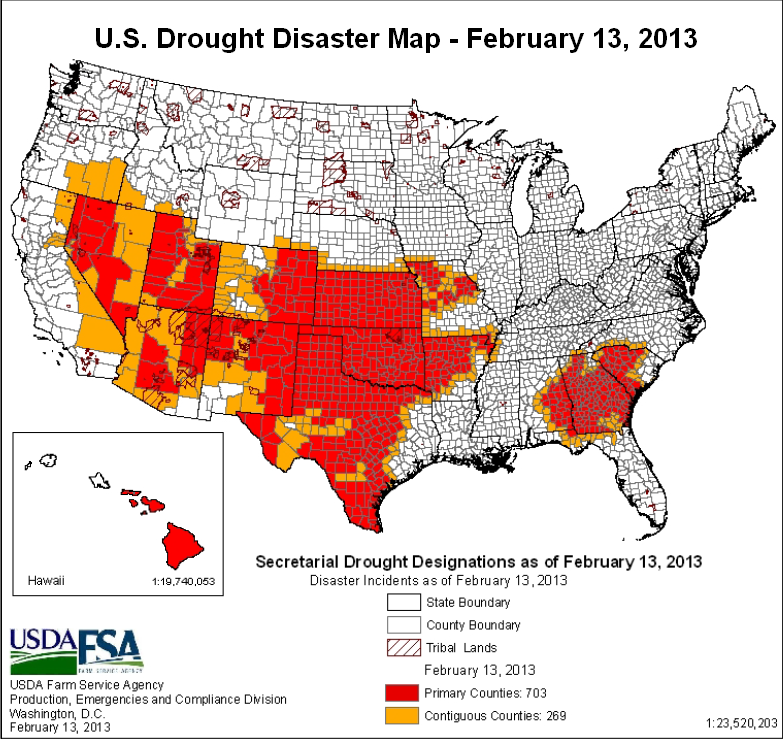 Listing of Disaster Designated Counties, Drought Specific, (PDF, 145 KB) February 13, 2013. Listing of Disaster Designated Counties, Drought Specific for 2013, (PDF, 1.1 MB) February 13, 2013. In the week to February 12, the area covered by drought levels D1 to D4 receded by about 1 percent. Drought Map for Contiguous U.S. dated February 12, 2013, released by US Drought Monitor on February 14. [February 8, 2013] Mass die-offs resulting from human impact and the planetary response to the anthropogenic assault could occur by early 2016. ‘Historic Storm,’ Blizzard, Hurricane Force Wind, Flood, Fire Weather… Lay Siege to U.S.
Two separate storm systems, one moving from the Great Lakes and the other from the East Coast, are expected to merge into a historic blizzard, exploding over New England and New York this weekend. WINTER STORM WARNING is in effect for NY and New England from 6 am Friday to noon EST Saturday, NWS reported. northeastern U.S. with blizzard conditions possible for portions of New England – valid 00:00UTC Fri Feb 08, 2013 to 00:00UTC Sun Feb 10, 2013- NOAA reported. Up to 2 feet of snow could blanket some areas. Hurricane force winds are forecast in the region. 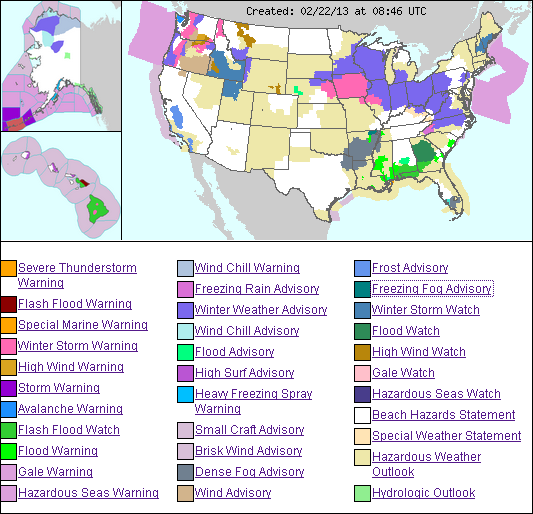 At least 31 different weather Warnings, Advisories and Watches were in effect throughout the lower 48 and Alaska, as of posting. [February 7, 2013] Mass die-offs resulting from human impact and the planetary response to the anthropogenic assault could occur by early 2016. The U.S. Department of Agriculture (USDA) has designated 58 counties in 8 states as primary and contiguous disaster areas due to damages and losses caused by the recent drought. The latest disaster list includes counties in the states of Alabama, Arizona, Florida, Georgia, Nevada, South Carolina, Texas and Utah. 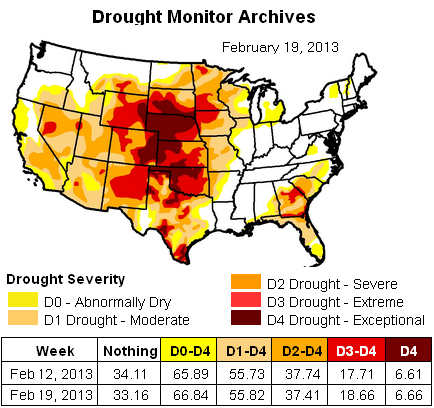 Drought Map for Contiguous U.S. dated February 5, 2013, released by US Drought Monitor on February 7. Major winter storm is forecast for parts of the Northeast and New England Friday into Saturday. “This Nor’easter-type storm system will bring strong winds and heavy snow to the region. Eastern New England will see the greatest effects, and a Blizzard Watch has been issued for Boston and surrounding areas.” NOAA reported. [February 3, 2013] Mass die-offs resulting from human impact and the planetary response to the anthropogenic assault could occur by early 2016. Mega drought and deluge have left about 4 million people food insecure and children at a high risk of malnutrition and disease across Malawi (population: ~ 15 million). Severe flooding, triggered by extreme rain events, has destroyed homes, crops, roads and any semblance of public infrastructure. Flooding has displaced tens of thousands of people leaving them without food, shelter, clothing or medical supplies in the landlocked country in southeast Africa. The flooding has also compromised access to safe water, sanitation and overall hygiene in the affected communities, said UNICEF. “We remain on high alert as the flooding spreads to other areas,” said the UNICEF Country Representative in Malawi. [February 2, 2013] Mass die-offs resulting from human impact and the planetary response to the anthropogenic assault could occur by early 2016. Fighting between local tribes over gold in the Jebel Amer area in North Darfur has displaced or severely affected 100,000 people, the United Nations reported. “Many of these people are living in the open in appalling conditions,” the United Nations Office for the Coordination of Humanitarian Affairs (OCHA) said. Most of the refugees have fled to the town of El Sireaf, where all public offices and schools have been closed to shelter them. Meantime, hepatitis E outbreak in Upper Nile State refugee campsites in South Sudan has infected more than 3,000 people killing about 70 since July 2012, UN said. Mozambique: Severe flooding in Mozambique has displaced up to 200,000 people, killing more than 60, as torrential rains continue to spread flooding. Botswana: Flooding due to extreme rain events in the North-East and Central Botswana has severely affected about 10,000 people since mid-January 2013. Zimbabwe: Extreme rain events since early last month have affected about 10,000 people across Zimbabwe, with half of the victims requiring humanitarian assistance.